Hospital Beds For Sale From Mobility Rentals and Sales - Mobility Rentals and Sales has a quality range of hospital beds for sale and hire throughout Australia. 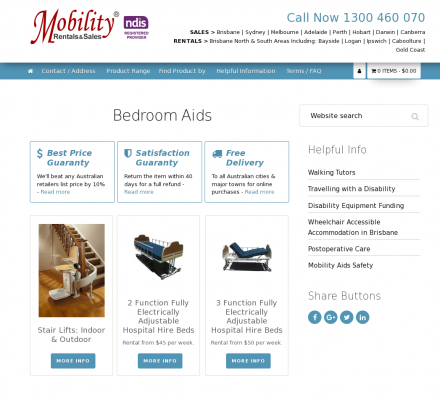 Mobility Rentals and Sales has a quality range of hospital beds for sale and hire throughout Australia. Whether you require a hospital bed for the long or short term care of a loved one, look no further than Mobility Rentals and Sales. Description: Health, Home Health - Hospital Beds For Sale From Mobility Rentals and Sales. Mobility Rentals and Sales has a quality range of hospital beds for sale and hire throughout Australia. Quality Shower Filters (Popularity: ): Quality shower filters clean the contaminated water from the impurities, chlorine and various chemicals making water fit for shower. Water filters (Popularity: ): Offers water filters for home and family. Deals in water filter systems, drinking water filters, reverse osmosis water filter etc. Information on Minimally Invasive Procedures (MIP) (Popularity: ): Information about the benefits and risks of minimally invasive abdominal surgery and other procedures from Ethicon Endo-Surgery. Aquasana (Popularity: ): Aquasana offers a wide range of water filters and filtration products which keep family healthy. A & B Medical (Popularity: ): A & B Medical Supply is a provider of oxygen systems and medication for people with breathing conditions.